This postcard started a long piece of internet detective work, that unfortunately failed. At least at first. Angela in another picture she gave me, this time surrounded by her daughters Veronica (on her right) and Colleen at her home in Rye. It was Veronica who first introduced me to her mother. While I was visiting her in February 2008 at her home in East Sussex, Aunt Angela (née Stock) gave me the card. It shows Albert Coates, a conductor (she said) who had apparently given her the card when she was just a little girl. What was interesting (because she remembers a great deal) is that Aunt Angela did not remember how she and Mr. Coates were related! She wondered if I might try to find out. 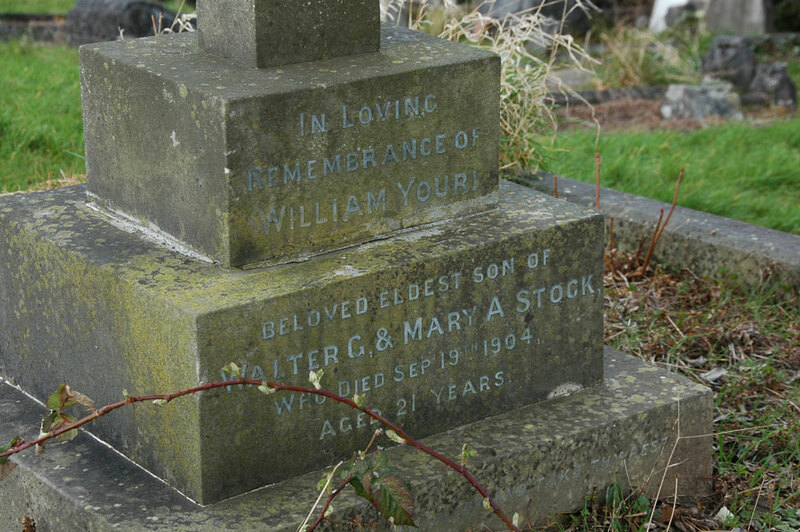 The grave of Angela’s paternal grandparents, Walter George Stock and Mary Ann née Thomas, in Swindon. The poor couple outlived two of their children, whose names and dates are also inscribed there. As it turned out, it was quite a challenge. Mr. Coates appeared on the internet, but not in a lot of detail. His Wikipedia biography mentioned no family members named Stock, Thomas or Munro, the three family names which I knew from the older generation on Angela’s side of the family. Google searches threw out nothing that seemed pertinent to Angela’s question. 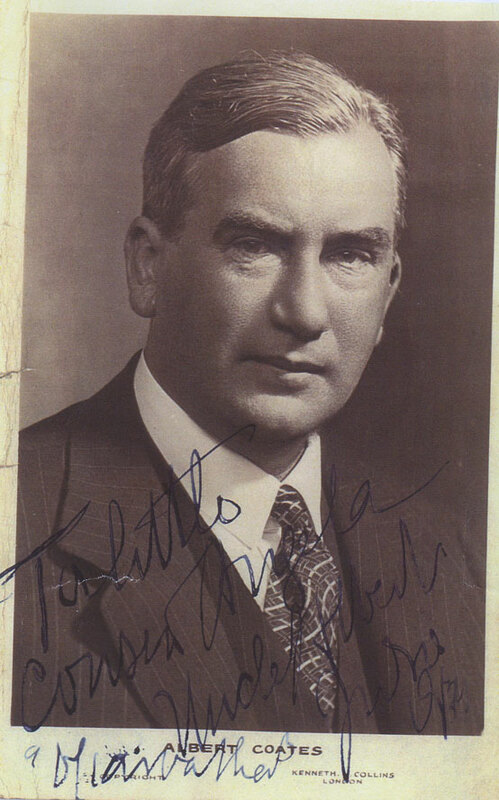 There was a fair bit of information about his conducting and recording (he recorded the first operatic scenes that the BBC ever broadcast, in 1936! ), but less about his musical compositions and nothing about his family. As Mr. Coates had been raised in St. Petersburg, presumably speaking at least some French, he was perhaps describing Aunt Angela as the child of his cousin. “Petit cousin” in French does mean child of a cousin. His Russian origins were also intriguing, because two other older relatives of Angela in Swindon, Wiltshire, were given Russian names. But I had no way to verify the possibility that they had a Russian connection, or discount it. Angela’s uncle William Youri was the oldest of Walter and Mary Ann’s children. Youri (or Yuri) is Russian for George. Around this time, I did one of my almost random Google searches. Google searches are fun to play around with at times, just to see if they bring out anything interesting. Most of the time they don’t, but it’s still a fun distraction. In this particular search, I lumped together Solihull School in England, where I spent a couple of early years as a pupil in the 1960s, and UC Berkeley, where I spent three years as a student in the 1970s. I was wondering if anyone else had attended both institutions. Not surprisingly, because they are worlds, not just continents, apart, almost no-one had that I could find. But there was one man who had links to both. I am reluctant to name him because he is of some reknown in his chosen profession and very much alive. One has to be careful when everything written down is recorded somewhere, as here, something that I’m finally figuring out! My helpful correspondent, a musician with connections to both Solihull School and Cal. He learned to play the organ on the Solihull School Chapel organ while a pupil there in the 1970s (our paths did not cross), and joined the faculty at UC Berkeley in the 1980s. 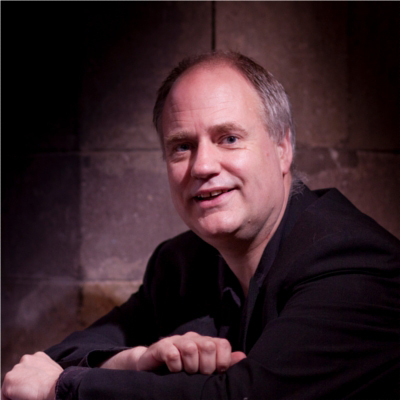 He is now a music professor in the UK, and his musical career has been extraordinarily diverse and accomplished: he is anything but an under-achiever! But he still found the time to respond to an odd email that I sent to him, introducing myself and asking after Albert Coates. The introduction made some sense, because of the rarity of attendance at both Solihull and Cal in the same lifetime. But I took a chance and asked after Mr. Coates, explaining why I was asking, which may have seemed a bit strange. I knew that it was an off-chance, but as a Professor of Music, perhaps he would know more than the average afficiando, and just might know something about the conductor’s family. Amazingly enough, he did! He told me that another living musician whom he knew personally is Albert Coates’ granddaughter. The two living musicians have some overlapping musical interests, which may explain how he knew such a detail. If I could ask her, she could perhaps fill us in about her grandfather’s relationship with Angela. 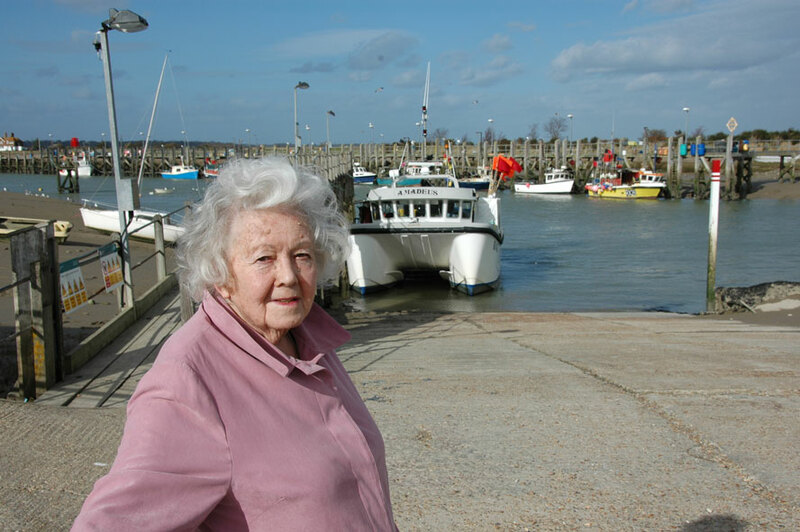 Albert Coates’ granddaughter, from her own web site. As only people who know her can recognize her here, my theory is that anonymity is sufficiently protected despite the photo. But after this initial thrill of excitement, I couldn’t make contact with the granddaughter. The Solihull correspondent thought that she lived in South London, and that her mother was still alive in Australia. 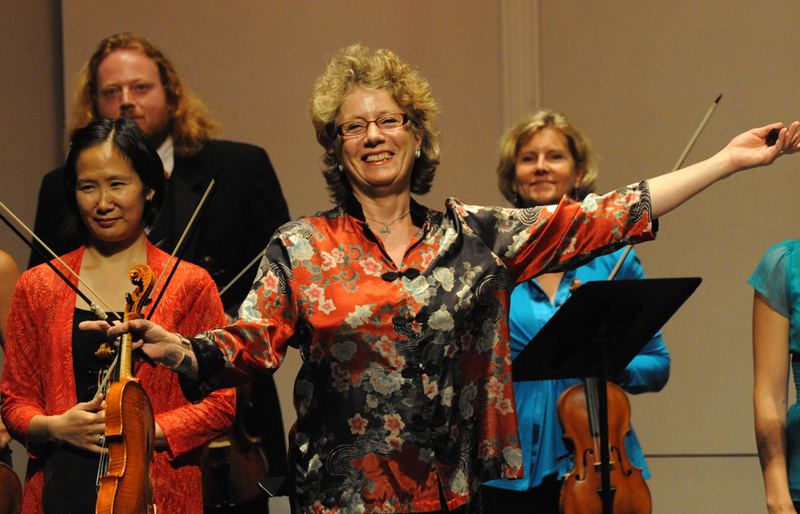 I did find traces of her in London and performing more than once in Monterey and Carmel, just down the coast from us in Santa Cruz, but no email or snail-mail address. Oh well! It took two years before a letter from Angela or a pending visit to her, something of the sort, prompted me to follow up with the granddaughter. This time I finally was able to make contact with her. Another serious over-achiever, she too found time to respond and follow up, for which I was very grateful. But she had no idea what relationship her grandfather may have had with Aunt Angela. I coaxed her to ask her mother, which she graciously agreed to do. Aunt Angela strolling alongside Rye Harbor during early 2008. Here’s the part which felt bad. Her mother was 88 years old and ailing, and unable to respond when she was asked about this postcard and the relationship it embodied. Not only that, but apparently her own father, Mr. Coates, had remarried after he and her mother split up, and the stepmother had wanted nothing to do with his daughter from his prior marriage. So perhaps my questioning the daughter reawoke that loss in the mother. If so, that’s not good, and I apologize. I had to admit that I was at a dead end. I stopped looking. Fifteen months later, in February 2012, an email arrived out of the blue. The missing link, and what a lovely face she has! Mary Ann Coates, née Gibson, was Albert Coates’ mother. 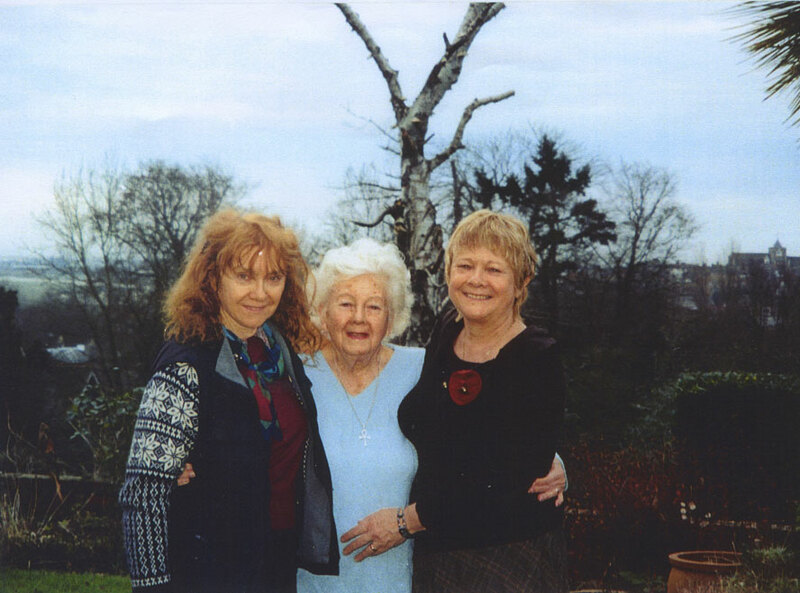 She was also the aunt of Edward Gibson, who married Angela’s grandmother’s sister. Well, not entirely out of the blue. I had posted this little mystery on my old family website in 2008, and someone doing web research on his own family found it and realized that he could solve the mystery for us. And he did! It’s all very simple, once you know the facts! Simon, the emailer out of the blue, was researching the Thomases, as a part of looking into his own family background. 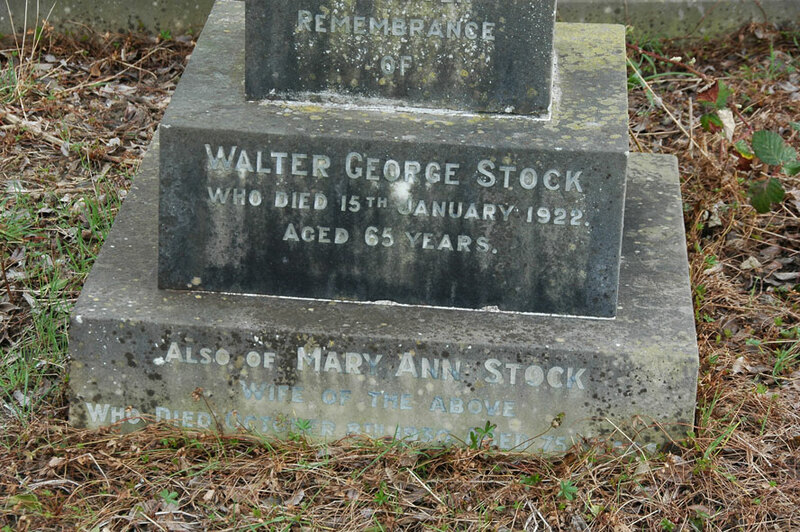 Walter George Stock, Angela’s grandfather, had married Mary Ann Thomas. Pictures of their grave are above. 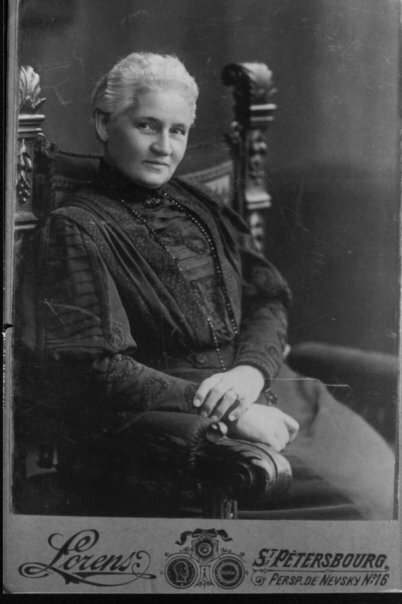 Her sister Margaret had married one Edward Gibson, whose extended family had lived in Russia from 1837 to 1918. Edward Gibson’s aunt Mary Ann Gibson had married Charles Thomas Coates, both in Russia, and one of their sons was Albert Henry Coates, the composer. Bingo! It’s easy when it’s spelled out for you. Not a big deal for anyone, perhaps, but gratifying to unravel. Also, even though he’s not a Stock, Simon is a couple of degrees closer to Aunt Angela than I am! His father was her second cousin. No progress would have been made here without the internet. It’s a two-way medium. I approached people looking for an answer, and months later Simon brought it to me. “The medium is the message,” as Marshall McLuhan wrote. NB. Follow up on this post, Aunt Angela’s connection to a great English war hero, can be found here.